Here’s what Rhydian gets up to after a two show day. A taste of Panto life! Rhydian gives us a taste of life during a rare day off in pantoland. Chesterfield Theatres cast new Cinderella! 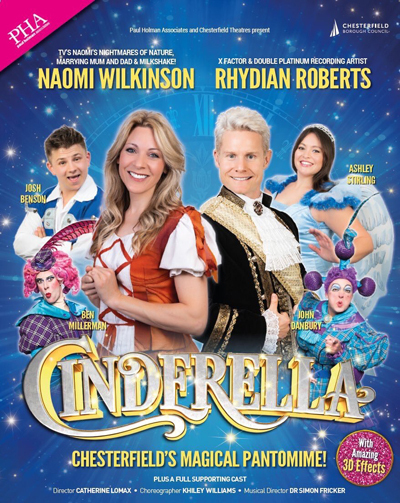 Chesterfield Theatres are pleased to announce that this year's pantomime will now star Naomi Wilkinson (Milkshake, Marrying Mum & Dad, Countryfile) in the title role of Cinderella alongside Rhydian Roberts as Prince Charming. The cast also includes Ashley Stirling and Josh Benson, with Ben Millerman and John Danbury as the Ugly Sisters. So get your invitation to the ball right away! Be ready to hiss and boo the Ugly Sisters, cheer Cinderella and her best friend Buttons and find out if the slipper fits in this sparkling show which promises to be a hit with all the family! Following a sell-out UK theatre tour with 'Les Musicals' this summer, Rhydian and Jonathan will re-unite to appear together in a Charity Concert at Halton Stadium in Widnes, Cheshire on Saturday 27th October 2018. 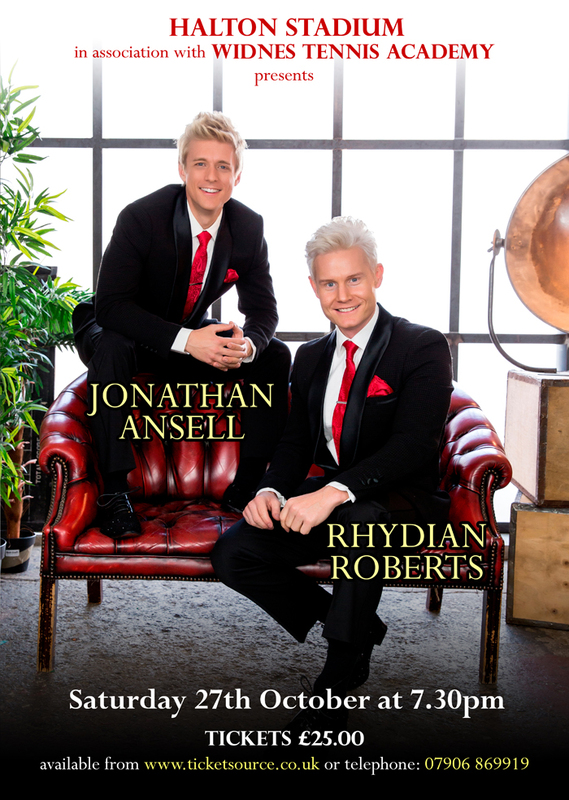 In an evening of World Class entertainment Rhydian and Jonathan will be singing some songs from their successful Les Musicals tour as well as other well known songs which, as Rhydian hinted on Twitter, may include one of his own favourite classical duets. The show , also featuring support, is being held to raise funds for Widnes Tennis Academy who are donating 50% of the proceeds to the family of a member who, having only recently conquered breast cancer, has now been diagnosed with brain cancer. The young lady has a husband and a 9 year old son, all much loved and valued members of the academy. Your support will enable the Widnes Tennis Academy to help them. Online booking link is available on our Live Events pages, or call 07906 869919 for details. "Roxanne Pallett has today decided to step down from her upcoming role as Cinderella in Chesterfield, in order to take some time out and reflect on recent events. We wish Roxanne the best and will be announcing her replacement in due course." Star Cast Announced for 2018 Pantomime! 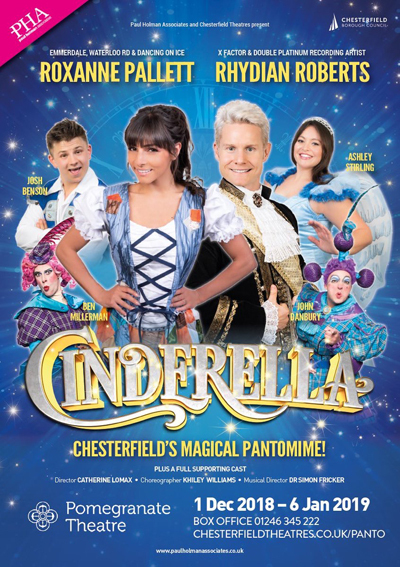 Rhydian will be starring with actress Roxanne Pallett (Emmerdale, Waterloo Road, Dancing on Ice) in this year’s magical family Pantomime, Cinderella, at Chesterfield’s Pomegranate Theatre, from Saturday 1st December 2018 to Sunday 6th January 2019. Roxanne and Rhydian will be reunited in this year’s production of Cinderella, having already performed together in the 40th Anniversary Tour of 'The Rocky Horror Show' in 2014. This classic ‘rags to riches’ tale will enchant both young and old, with its magical effects, lavish sets and stunning costumes. So get your invitation to the ball right away! Be ready to hiss and boo the Ugly Sisters, cheer Cinderella and her best friend, Buttons and find out if the slipper fits in this sparkling show which promises to be a hit with all the family! Booking links for tickets available on our Live Events pages. Dinner on the Tour Bus! Rhydian gives us a glimpse of life on tour as he finds time to cook dinner on the tour bus before his sound check in Portsmouth. 6 May: Check out the 'Les Musicals' promo video! 5 May: A visit to the recording studio! 7 April: In Arizona, USA!